Last week: Juniors want variety. They want to be loved. They want to feel secure and appreciated. They want to be recognized. If you want to be successful, you must show by deeds, not words only, that they are important to you. It is said, “There are tricks to every trade.” It is certain that we who teach juniors can learn some tricks that will help us hold the attention and recapture it after a conflict with some intruding interest. Any device that will harness the curiosity and appeal to the primitive spontaneous attention of the juniors can be called an attention trap. It may be a picture, a curio, a souvenir, a book, a dress, a letter. It may be anything that is interesting. You might have it in a bulging pocket, in your handbag, in a conspicuous carton, or in a big envelope. You might remark casually that you have brought something of great interest to show them during the lesson. Then you start off with the study. If, after a few minutes, your pupils become restless, put your attention trap on the table or on your knees, but don’t open it; you won’t need to. That slight action has riveted every eye. So go on with your lesson. Next you may slip your hand into the box, but don’t bring out your prize yet; you won’t need to. That simple action compels the attention of the class. Then by and by the right time comes, the picture or curio is exhibited, and it has helped much to hold the attention. For a postgraduate course in attention traps, spend an hour or two on Maxwell Street, Chicago. There you will find artists selling vitamins, ointment, linament, and what have you. One has gadgets in his hands, one says he has a dragon that really walks in a box, one has a blowtorch that is heating a soldering iron red hot to burn a hand that has been made fireproof with a small application of some amazing ointment. Watch the man nearly let the dragon out. Watch the crowd. Watch the man hold up the red-hot iron. Watch the crowd. I confess I stood there twenty minutes to see that dragon, but I saw neither the dragon nor saw the iron burn the hand. It began to rain, and we had to leave, but someday I am going back to take another lesson in attention traps. Where there are no movable chairs or benches, but only pews, a similar arrangement can be had by the teacher’s kneeling on the front pew between the two most motor pupils. In one large primary division room I found the classes grouped in two rows of chairs each, facing the leader. The teacher sat in the rear row between the two motor pupils, and within touch of each member of his class. At lesson study time the teacher moved back a little, the front row turned around, and the motor pupils moved to make the half circle above mentioned. This gave the maximum advantage with the minimum disturbance. Many teachers have been amazed at the results this class arrangement has produced and are surprised that they had never thought of it before. The teacher can also have every detail prearranged so that there is never an empty second. Let the reviewer or the singer or the storyteller or the secretary be there with his mouth open, ready to start the second the leader has introduced him. The time it takes for the reviewer to walk from the back of the room to the front is abundant time for a riot to start. Fill every second. Remember, Satan finds work for idle hands (and minds). 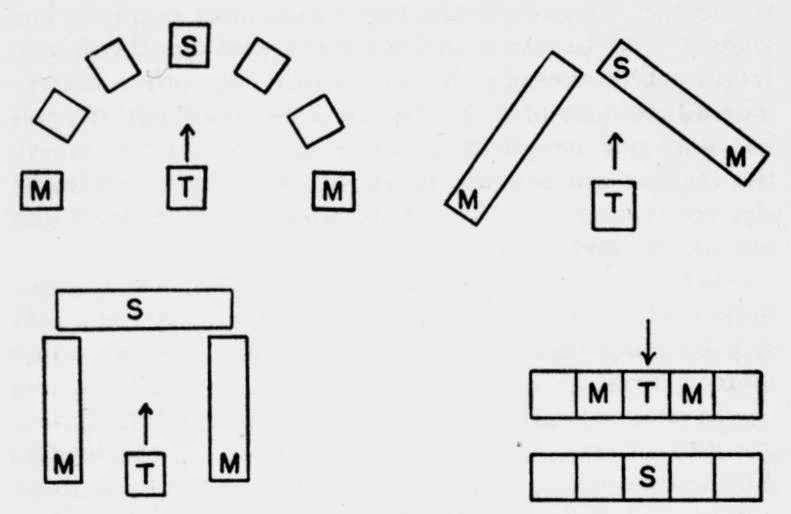 The ideal class formation places the most motor pupils (M) at the right and left of the teacher (T), with the sly, tricky pupil (S) directly in front. Where there are pews, the teacher kneels between the motor pupils, facing the class. When the class sits in two rows of movable chairs, the teacher sits on the back row with the motor pupils on either side. At classtime the teacher and the motor pupils move back, the front row turns around, and the ideal half circle is formed with a minimum of movement. The teacher can also practice speaking clearly and giving commands with authority as though expecting to be obeyed. This ability is rarely natural and must be cultivated. How often have I seen counselors at junior camp struggling with the new experience of giving commands, and puzzled because when they say, “Attention,” there is no snap, and when they say, “Forward, march,” the children march along higgledy-piggledy. Soon they learn to say, “Atten-SHUN!” and, “Forward MARCH!” and ah, what a difference! In short, securing attention and holding the interest does not come by accident, and it does not just happen. It is an art. It needs lots of study, lots of planning, lots of work, but what worth-while results it yields and what a glorious reward is promised. 1. John Adams, Primer on Teaching, p. 47. 2. Education, pp. 305, 306.